GIFT CARDS. The perfect gift. Very unique. 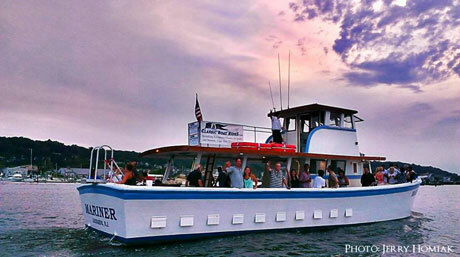 Treat a friend to a Classic Boat Ride on the Navesink River. Take a Sandy Hook Bay boat tour. It's easy for folks to get Atlantic Highlands and Highlands confused and so many people do. When looking for Classic Boat Rides Charter boat Mariner be sure to GPS Atlantic Highlands (not Highlands) The best address to use is 8 Simon Lake Drive Atlantic Highlands NJ 07716. This will take you to Sissy's Breakfast and lunch and On the Deck Restaurant. At the front door of Sissy's, turn right and go down the ramp to the floating dock PIER 1. Then turn left down pier 1 and MARINER is in the 2nd slip on the right. Slip 5 on Pier 1. Sea you soon. Thank You. Tickets are on $AIL now for all of our 2017 Public Cruises. NEW LOWER PRICE. Sea you soon! BUY TICKETS NOW for our Thursday Night Anchor Jam with Live Music!